From the creators of N.Y.Zombies comes an all new blend of action, adventure, castle defense, and role playing elements! 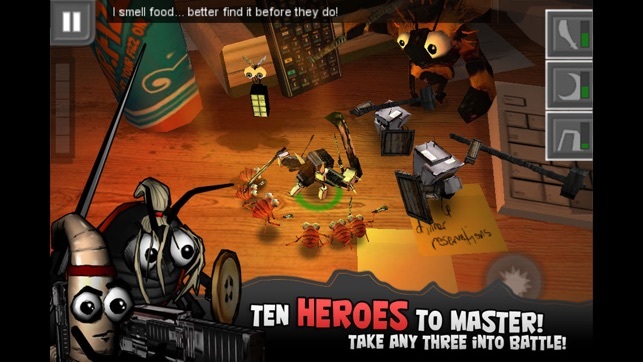 Master up to nine legendary Bug Heroes, including a sword wielding Spider assassin, an armored Beetle warrior, a machine gun toting Ant engineer, and more! 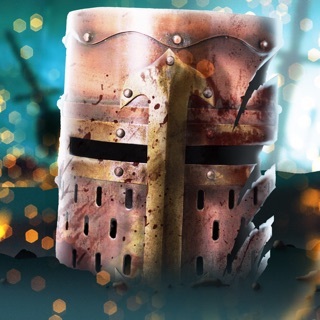 Shoot, slice, dice, and bash your enemies with a variety of skills, abilities and equipment. 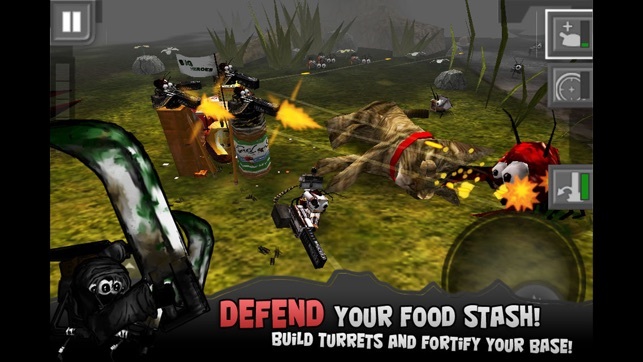 Stockpile food, fortify your base, and defend it from hordes of hungry bugs. Explore a variety of familiar landscapes from an all new miniature perspective, collecting food, coins and other items. Enter Bug Heroes, an epic fantasy world you never knew existed! Ranked one of the top iOS games of 2011 (metacritic.com)!! "...it's going to be really hard to ever find a way to enjoy a typical dual-stick shooter again." 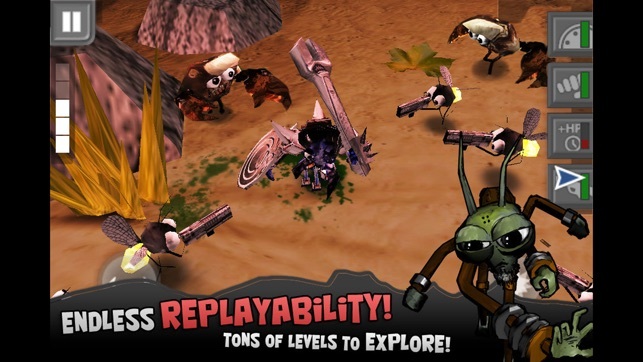 "One part castle defense, two parts dual stick shooter, and a dash of RPG; Bug Heroes is the most interesting blend of iPhone gaming I’ve see since Infinity Blade." 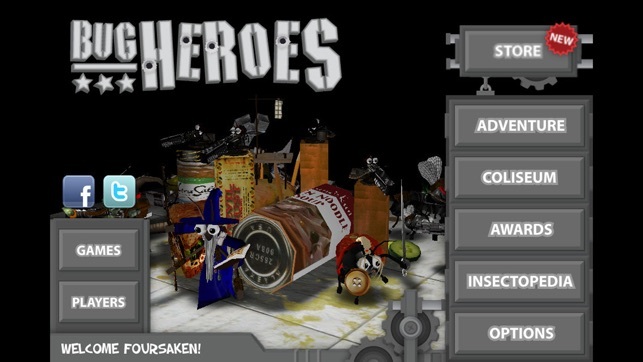 "Bug Heroes has slick presentation, charm, and lasting appeal... 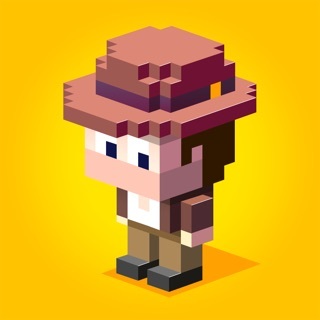 In my opinion this is one of those games that defines the iOS platform for gamers." "Without a doubt, Bug Heroes is the year's first must-have release." 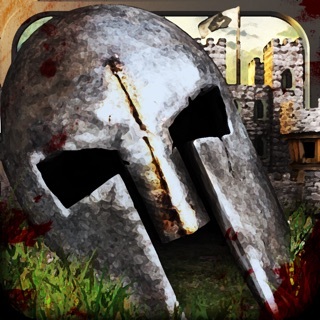 - A seamless blend of action, adventure, castle defense, and role playing elements! 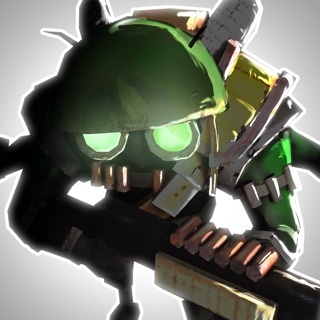 - 10 unique Bug Heroes to play as, each with different strengths, weaknesses, equipment, and personalities. Choose any 3 heroes to take into battle! 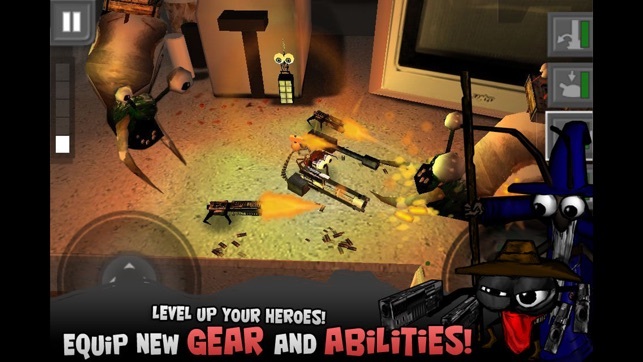 - Level-up your Bug Heroes, increase their skills, and customize them with a huge variety of equipment and abilities! - Melee and ranged combat. Slice your enemies with swords, swat bugs off of ledges or into walls, and blast them from long range with rifles and machine guns! 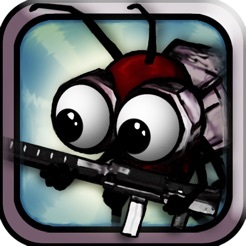 - Scour the lands for food, then defend your food stash from hordes of hungry bugs. Build turrets and fortify your base! - Optional, randomized side quests for even more depth and re-playability! - Over 50 unique enemy types, ranging from tiny fleas to giant snails. Detailed "Insectopedia" for background info and strategies on every single enemy! - Multiple profiles and game saves, tons of achievements, and online leaderboards! - Supports all devices, old and new. Enjoy crisp retina graphics on the iPhone 4 and iPod Touch 4g! If you have any questions, comments or suggestions, and for all news on upcoming updates, like us on Facebook or follow us on Twitter @FoursakenMedia! Bug who’s is such a great game and there’s nothing better that feeling of nostalgia. It brings back so many great memories. Just as amazing as I remember it! I know this game has been around for a while and the graphics aren’t the best but Skyrim doesn’t have the best graphics either and look at how great of a game that is! Please take a chance on the game and enjoy. 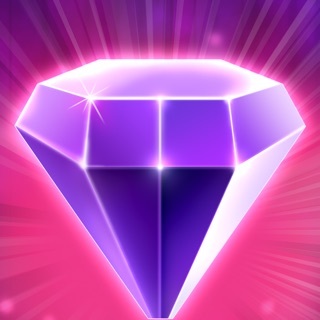 Pretty much the best, most entertaining game on the App Store. I’ve had this game for years and have played it relentlessly. I would love to give this game 5 stars as it is the perfect RPG with such depth and it’s unique little world and style. But it crashes constantly, especially when you get far. All your progress gets lost and starts over at some random round. It almost unplayable now. Such a shame. It was such a great game. So happy they upgraded this to 64 bit. It doesn't end (like temple run or something), but it is different each time you play. I can spend an few mins playing here and there with save games, or I can play for an hour straight blowing up bugs and scorpions and snails. Great times!